What's Really the most important thing to teach kids at Christmas? Your worth is based on your Creator, not your actions. Jesus Christ is salvation, for both the naughty and the nice. God loves you more than anyone else in the whole world! This little guy will have your children (and you) charmed off your feet from the minute you meet him! He can't wait to join your family this Christmas season and teach you all about the character of God through short Bible lessons and fun family advent activities. 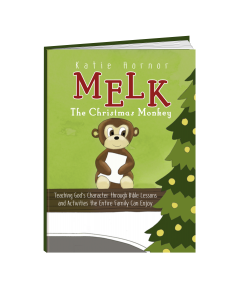 Join our mailing list below and we'll send you TWO of Melk's lessons for FREE. Submit your email below and you'll receive two lessons preview. You've nothing to lose and lots of fun and meaningful activities to gain, so go ahead, sign up and then look for your FREE lessons to arrive by email from paradisepraises at gmail dot com! You're moments away from receiving Melk's FREE lessons. Just tell us where to send them!